The historic main plaza of Trujillo, Peru's 2nd largest city, is surrounded by beautifully painted buildings, reminiscent of Cartagena. 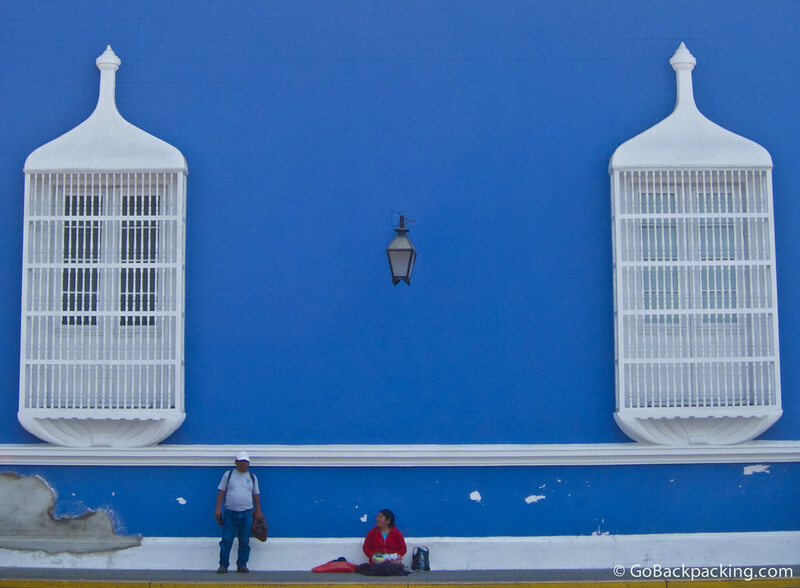 As I was walking around, I was struck by this scene: the richly painted blue wall, grand white windows, and how humble they made the woman selling gum beneath them appear. I was in Trujillo on March 2013 right in the begining of Easter week. It is a beautiful city with a great number of interesting buildings. When we were there, In the main plaza was an event celebrating the 25th aniversary of a private university and they had a show that lasted for about 4 hours with folk music from all over Peru, We had a very pleasant stay. Trujillo is worth the visit.